Kinesiology tape can be a useful tool to strength athletes for multiple reasons. 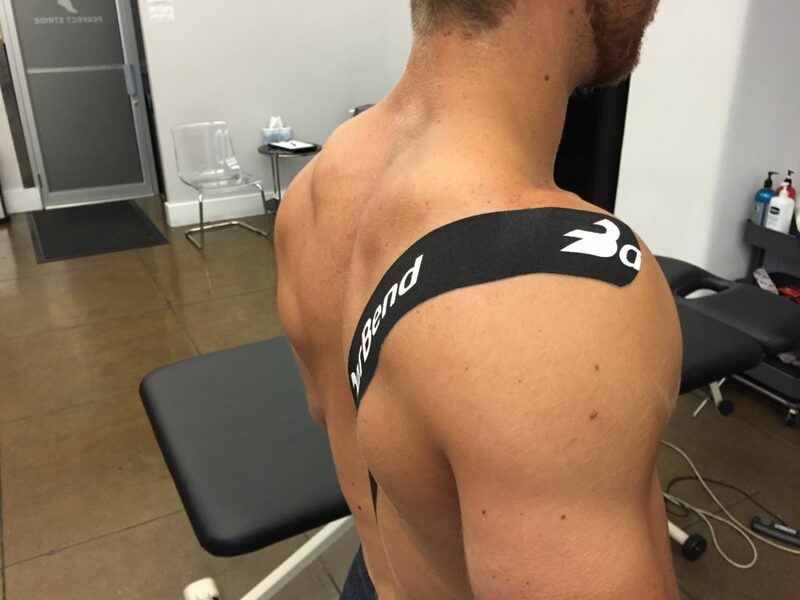 This article is going to dive into why an athlete would tape, or need to tape the shoulder. One of the main, and possibly biggest reasons to tape the shoulder, is for additional stability that’s created through mental proprioceptive cuing at the shoulder. To help us learn more about this, we reached out to Joe Gambino, PT, DPT, and CSCS at Perfect Stride, New York City. 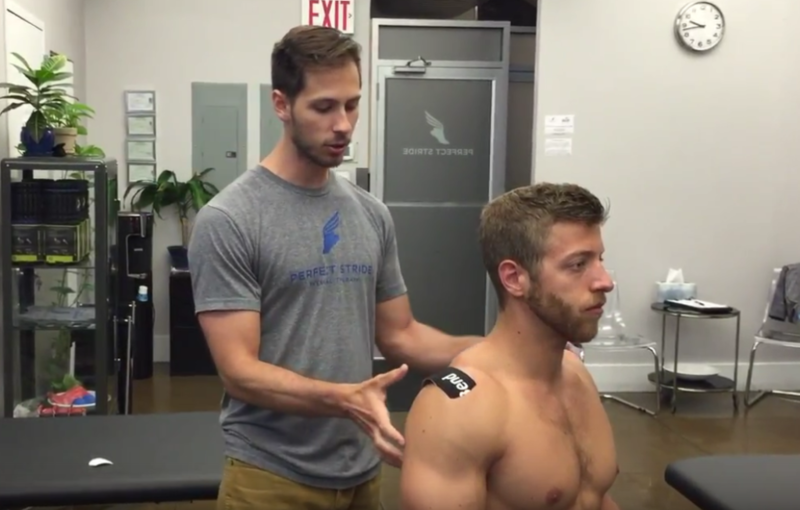 Check out the video below where Gambino shows us an easy shoulder taping method, plus read on to the descriptive text that explains why taping the shoulder can be a useful tool for athletes. Note: All motions shown are for informational purposes only. The information in this article and video is not meant to prevent or cure any disease or injury. It’s always a good idea to consult with a medical professional or trainer before attempting any new training methodology. If you experience any sharp pain while exercising, discontinue movements immediately. The shoulder joint is an area on an athlete’s body that requires ample stability, but sometimes needs additional help. It’s an extremely mobile joint, so if there’s any lack of stability, then an athlete’s performance can decline. Below are a few of the body parts that make up the shoulder joint and that will be in direct contact with the tape. Tape can help cue the body to increase stability by reacting with some of the skin’s proprioceptors. The above areas are common landmarks the tape will run over, which can help subconsciously cue the body to increase its level of stability surrounding the shoulder joint, and upper back area. Begin by measuring out tape to span from the acromion process (bony shoulder landmark) to the mid-back/spine. Once an athlete finds the amount of tape their body requires, then they’ll cut it accordingly and round the edges, so it doesn’t get caught on clothes. Feel around on the shoulder for the bony landmark that’s toward the front/middle of the shoulder (everyone will be slightly different). Peel off roughly two inches of the tape’s paper and place the first anchor covering the acromion process. Once the first anchor has been placed, rub it in for a few seconds to activate the heat activated adhesive. After the anchors fully placed, wrap the tape in a diagonal fashion, so it goes over the rear shoulder to the mid-back. *This is a taping method that will typically require a friend, physical therapist, or coach to assist with. It can be difficult to achieve the right placement and stretch with self-application. With the first anchor in place, peel the back of the tape off, leaving two inches for the second anchor, and apply a 20-50% stretch over the diagonal taping area. Gambino discusses that this percentage will be effective for most athletes, and the research is still sparse on a tape’s amount of stretch and its effectiveness. Once the tape is in its final placement over the shoulder and down the back, rub it in similarly to the first anchor. As the tape becomes flush with the skin as you rub it in, peel off the final two inches of the tape for the last mid-back/spinal anchor. Rub on the final anchor, and progressively work your way up the tape rubbing the whole strip to ensure there are no areas that will get caught on clothes. The final tape job will look similar to what’s shared above. Everyone’s body and tape placement will be slightly different due to anthropometrics differences. This is why it’s important to establish your anchor points before applying the tape. Create Tension: Pay attention to how the joint moves and create tension with the tape by slightly retracting the scapula and sitting upright. Proprioception: Gambino stated that tape itself isn’t the cure for joint instability, but it’s a facilitator for the body’s perception of it. The skin is very sensitive and the tape’s ability to create tension will give the brain feedback to increase stability in the joint being taped. Stretch: Another aspect Gambino talked about was the amount of stretch for stability. He said that research is conflicted on how much stretch you need, and he usually does 20-50% stretch to enhance the additional proprioceptive feedback. Hair and Taking It Off: If you’re excessively hairy in a specific area, then you’ll pull off little pieces at a time, and use your hand to gently repeatedly chop the tape off (in a karate chopping motion). You can also pinch the skin to release some of the tapes tension, while taking it off in a partitioned manner. Cut the Edges: The final tip was the cut the edges of the tape, so it’s rounded. This will prevent the corners from getting caught on edges of clothes and shoes. Another view of a shoulder with kinesiology tape applied. 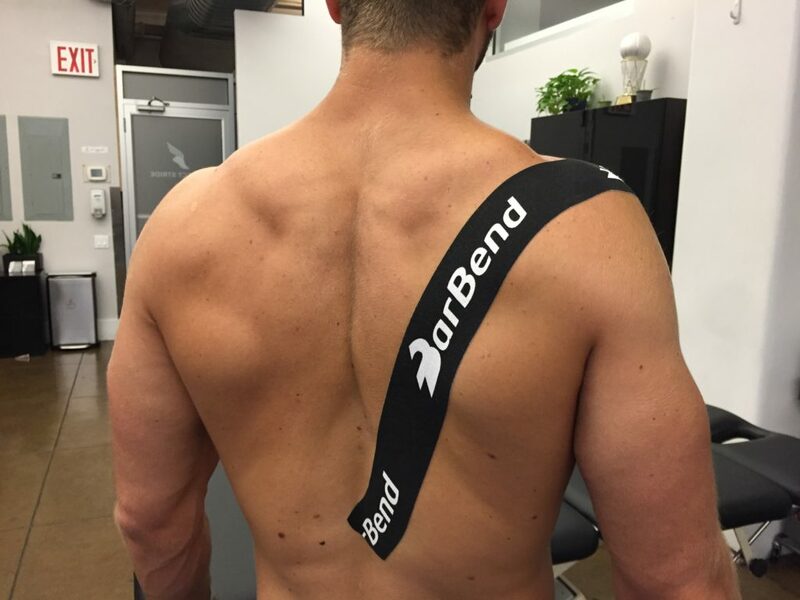 Tape isn’t an end all be all when it comes to providing the shoulder with stability, but if used properly, it can enhance an athlete’s performance. The goal of the shoulder tape is to give the body subconscious cues to enhance natural joint stability. When applied correctly, tape can be an asset for every strength athlete.